Little did Napoleon realize, when releasing Major Maurice Dietrichstein from a French prison in 1800, that the Austrian nobleman would one day be responsible for the education of his son, Napoleon II. More a musical connoisseur than a military man, Dietrichstein became the child’s governor after Napoleon’s 1815 defeat and remained in that capacity until the boy’s death in 1832. Though Dietrichstein was a strict taskmaster with impossibly high expectations, Franz (as Napoleon II was called in Austria) was grateful for the pains his governor took with his education. Count Maurice Dietrichstein (Moritz Joseph von Dietrichstein) was born on February 19, 1775 in Vienna to a Bohemian noble family. His father was Prince Karl Johann von Dietrichstein-Proskau-Leslie. His mother, Princess Maria Christina, was a friend of Empress Maria Theresa. This marked the end of Maurice Dietrichstein’s military career, for which he was probably not suited in the first place. He returned to Vienna where, on September 22, 1800, he married Countess Thérèse von Gilleis (b. 1779). They had five children, three of whom lived past infancy: Maurice (b. 1801), Ida (1804) and Julie (1807). The Dietrichsteins’ home became a centre for Vienna’s intelligentsia and beau monde. A cultured and well-educated man, Dietrichstein himself was an able composer. He studied with the Abbé Stadler and composed vocal music, both sacred and secular, as well as a number of dances. In 1811, he published 16 settings of Goethe’s poems to music, dedicating them to the poet, who praised their “charm” and “original character.” (2) Dietrichstein organized concerts for Beethoven, whom he revered. He was also a patron of Schubert, who dedicated his Opus 1 (D. 328), Erlkönig, to Dietrichstein. It is not surprising that this high-minded, learned gentleman was recommended by Baron von Hager, head of the Habsburg secret police, as governor for the grandson of Emperor Francis I. When three-year-old Napoleon II, the King of Rome (later Duke of Reichstadt), arrived in Vienna with Marie Louise in 1814, he was accompanied by a suite of French caregivers. Fearing that these women exercised too much French influence on the boy, and that they might be party to a kidnapping attempt, Francis I had them dismissed. The Countess de Montesquiou (the boy’s governess) left in March 1815, Madame Soufflot (the under-governess) and her daughter Fanny in October 1815, and Madame Marchand (the boy’s nurse, and the mother of Napoleon’s valet, Louis-Joseph Marchand) in 1816. “They talked to him of nothing but Paris, of his Court, his bedroom as a child,” complained Dietrichstein, who took up his post in June 1815. (3) Maurice Dietrichstein would make no such mistake. His task was to raise the child as an Austrian prince, though he held in the back of his mind that he might also be educating a future ruler of France. Dietrichstein undertook this job with the utmost diligence. Whether his temperament was ideal for the position is questionable. One has the sense that boy and man exasperated each other. Franz was bored by the things Dietrichstein most valued, the study of Latin and literature and music. He preferred dreaming of being a soldier, as when Dietrichstein finds him doodling in Napoleon in America. Maurice Dietrichstein saw Franz for an hour every day. He had other tasks. In 1819 he was appointed the musical director of the imperial court. In 1821 he also became director of the court theatres. He relinquished both posts in 1826 when he was appointed director of the court library. Dietrichstein did have an eye on the future of his prince, especially in light of the 1830 July Revolution in France. He wrote to Emperor Francis warning that the transfer of the Duke of Reichstadt to a provincial garrison involved a risk of “lessening his importance in the eyes of the French.” (10) In this, he was at odds with Austrian Foreign Minister Clemens von Metternich, who wanted to keep the boy’s profile as low as possible. 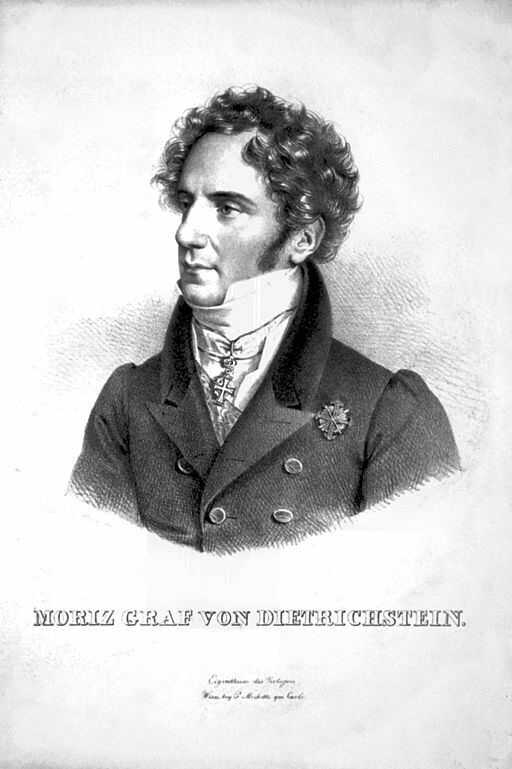 Maurice Dietrichstein continued as court librarian until 1845. In this capacity he succeeded in acquiring the original score of Mozart’s Requiem, among other things. He was also the director of the imperial cabinet of medals and antiquities from 1833 to 1848. Count Maurice Dietrichstein died on August 27, 1864 in Vienna at the age of 89. He was predeceased by his daughter Ida in 1822, his son Maurice in 1852, and his wife Thérèse in 1860. Dietrichstein was buried in the Hietzinger cemetery in Vienna. For a list of some of Dietrichstein’s compositions, see LiederNet. Répertoire des Connaissances Usuelles: Dictionnaire de la Conversation et de la Lecture, Vol. 36 (Paris, 1837), p. 276. Otto Biba, “Goethe’s Presence in the Vienna Music Scene of his Era,” in Lorraine Byrne, ed., Goethe: Musical Poet, Musical Catalyst (Dublin, 2004), p. 20. Dietrichstein was one of the founding members of the Gesellschaft der Muskifreunde in Vienna. Dorothy Julia Baynes [Dormer Creston], In Search of Two Characters: Some Intimate Aspects of Napoleon and His Son (London, 1945), p. 229. Jean de Bourgoing, Papiers Intimes et Journal du Duc de Reichstadt (Paris, 1927), p. 16. Edward de Wertheimer, The Duke of Reichstadt (London, 1906), p. 292. Papiers Intimes et Journal du Duc de Reichstadt, pp. 27-28. The Duke of Reichstadt, pp. 296-297. Papiers Intimes et Journal du Duc de Reichstadt, p. 166. Octave Aubry, Napoleon II: The King of Rome, translated by Elisabeth Abbott (London, 1933), p. 240. The Duke of Reichstadt, p. 454. Truly an interesting article… I have always admired those who are teachers and mentors. Oh, such a man he was! Thanks, Jerusha-Marie. I’m glad you enjoyed the article. How can you, at fifteen!!! – for the pleasure of astonishing me, which was no doubt your object, write me a letter full of corrections and proofs of habitual carelessness, of bombastic notions, disregarding all commonly accepted forms, extending even to your signature?